Every product or appliance likewise generators, each have different price range as per their features, pros and cons, with different levels of dependability. Some are designed to last long but still they are not much efficient as others while some are super-efficient and still break down in few years. Similarly some brands and models cost a lot while others are affordable as rough-and-ready solution. So today we will discuss about DuroMax Portable generators. DuroMax is a well-known company for the manufacturing of generators. They are the makers of their own engine, output and design, wide selection of power, greater fuel efficiency, longer life span and lower cost of operation makes DuroMax an excellent choice for who wants to have best and reliable portable generator in less amount of money. DuroPower that is the parent company of DuroMax now also provides larger stationary generators, power tools and engines to various factories and industries around the globe. Their commercial line is much geared towards greater returns and reduced costs. DuroMax generators are manufactured by DuroPower that is the origin of DuroMax. It manufactures a California based engine and power tools maker. Unlike other brands, they themselves make their own engines. They have already developed over 20 different models, 2 of them are the unique designs for single, triple or four cylinder engines. The brand name is synonymous with affordability and reliability. 1. All DuroMax portable generators are built with a cast iron sleeves. 2. Each model of DuroMax satisfies ETL and MTL standards. 3. It allows flexible warranty plan that is built into the product cost and also can be extended beyond normal one or two year warranty period. 4. Direct components and parts could be easily delivered by shipping in the world. 5. It is EPA Certified and CARB is only certified on few models. DuroMax XP4400E Portable Generator is compact and easy to assemble. It is a perfect standby generator in case of emergency situations. At 3500 Watt it cannot power all your appliances at home or power tools but it will provide ample of power for the selection of few items at a time whenever you need it most. Easy portability, low noise levels and decent performance makes this model of the most dependable and affordable DuroMax portable generator. Some companies facilitates you with basic portable generators for your power needs but there are also the ones that provides you with all the whistles and bells you will ever need in your portable generator. One of the good examples of the last is the DuroMax XP4400E. It has 4 gallons of fuel tank and it is able to run for 8 hours continuously at 50% load capacity. It also includes advanced AVR that is Automatic voltage regulator system. It also has low oil protection system that indicates and allows auto shut off generator when low oil is indicated. DuroMax provides one year warranty for this model. All the features in DuroMax XP4400E Portable Generator are designed to provide for any sort of power required with ease. The running watts of 3500 watts are more than sufficient and 4400 watts peak enables us to use lots of appliances without facing any issues. The electric start up mechanism is also very convenient, it’s starting and turning the key is just like the ignition or starting of your car. And even in case your battery is not charged, the backup manual start is quiet reliable way. Once you start your generator it works seamlessly and it also comes with a spark arrestor and a muffler too which enables it and makes it suitable for outdoor use too. The DuroMax XP4400E Portable Generator is built up to last long and the manufacturer’s attention to detail is obvious right from the beginning. Its packaging is also impressive as instead of flimsy packaging and padding that I have expected, but they use rather much better than that. They have used high quality card board and thick moulded foam padding, and also special shipping braces for ensuring that it will reach to you in perfect and undamaged. The care could be easily seen on the product itself. The front panel of generator is well organized and it has very clean layout for plugs and switches. It comes up with sturdy tires that can easily handle all types of terrain from gravel and sand to grass and dirt. Its hand grips are ergonomically designed. They have strong rubber grips that help to prevent any slippage. It is not much loud just 69 decibels. There is also a spark arrestor that makes it safe to use in parks also. Nothing is worse or to complain about in DuroMax XP4400E Portable Generator as it is perfect for any of the purposes you need to use. It’s not CARB compliant so just the California residents may have to worry about it none else others. 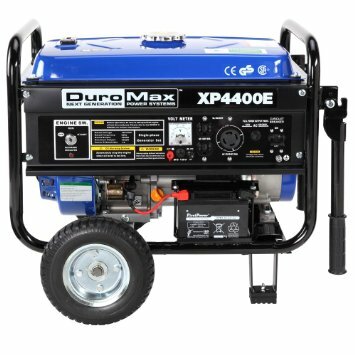 DuroMax XP4400E Portable Generator is the best generator, I will surely recommend it if you don’t have one yet. Every website and customer reviews stated and rated it among the top ones and best among all portable generators. DuroMax XP4400E Portable Generator is also the top selling portable generator on amazon. It has come up with lowest numbers of failures and defects among all other portable generators. We always prefer reliable things in case of emergencies, so DuroMax XP4400E Portable Generator is the most reliable and long lasting among all others of similar type.